Gantt charts have been widely used in many industries and fields from construction projects to business programs. Simply see this article to explore more popular roles in the uses of Gantt charts. Basically, a Gantt chart is a type of bar chart that shows a visual presentation of individual project task over a certain period, for example, several weeks or months. It brings a living and collaborative way of a project's current state. Gantt charts can be used in different scale of projects from small business to enterprises. The idea of Gantt chart was developed and introduced by Henry Gantt in western countries. Generate reports for cost and the overall project. So far, Gantt charts are widely used in construction projects, especially for contractors, building firm sponsors, engineers, homeowners and government agencies to negotiate tasks. By using Gantt charts, construction managers can also easily pick related administrative team members, undertake site survey, purchase materials and utilities, plan layout, decide individual task sequence and keep key workmates in the loop by developing an information system. Academic researchers from leading educational institutions in the U.S.A. have introduced Gantt charts to some science departments for displaying research history of statistics. For the IT field, information managers from technology firms integrate Gantt charts for the use of system applications solution. Marketing managers or promotion coordinators also find Gantt charts are great for planning both online and offline activities to face any unexpected changes in last minutes. Moreover, in the banking and finance sector, managers from national banks can use Gantt charts to establish effective contact center for their VIP clients, or manager deposits, credit cards and loans. All the participants in your project can conveniently find out major parts and key points in the well-structured Gantt chart such as time, workmates, external partners, materials, budget, and task names etc. Therefore, it is quite easy for every member to know their specific duties and work for the same goal continuously. Team leaders can use Gantt charts to monitor the using amount of resources across different departments, for example, financial cost, working hours, materials or equipment, so as to appropriately assign tasks to team members. It could be difficult for project managers to estimate the finishing date of the project, but by using Gantt charts every member can clearly check progress and modify according to the completed tasks, ongoing tasks and the future plans. In this way, an optimized work-flow can be achieved. All task details are clearly presented in a Gantt chart for all the team members to see and offer suitable comments. 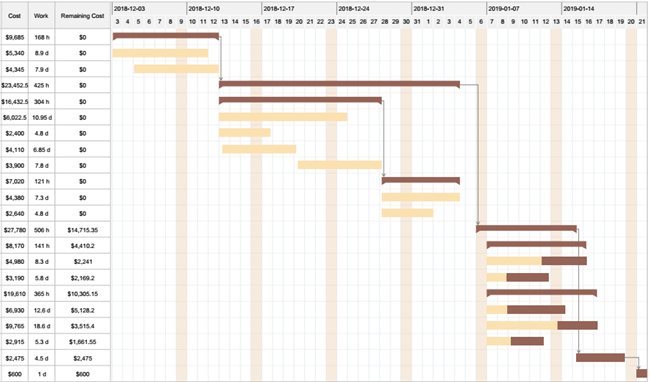 Besides, setting milestones in Gantt charts are great to offset working pressure especially for the long-term project. Therefore, everyone is on the same page to work for the same goal. How to Create a Gantt Chart with Software? With an easy yet professional Gantt chart software, you can create charts based on many basic settings such as adding new tasks, deciding data formats and units, naming tasks, building task dependencies. Furthermore, you can manage resources and generate financial reports for your project. Feel free to click on the free download button to try more advanced functions now.